Located in the Scottish Highlands, the Tullibardine Highland Scotch Malt Whisky distillery produces, ships and sells globally over three million liters of acclaimed whiskey per year. It is one of the few distilleries in Scotland to distill, mature and bottle all on one site. Operating in warehousing and storage areas where whiskey vapor emissions can be present, it was essential that any material handling equipment operating at the facility could be easily adapted with fire protection systems which provide audible and visual warnings of potential fire hazards. A varied range of indoor and outdoor handling tasks, plus working in confined and sometimes hazardous conditions called for a versatile choice of handling equipment to ensure optimum productivity while keeping costs under control. As whiskey is slowly maturing, roughly two percent evaporates through the wooden cask and into the atmosphere. And above all, the equipment had to be dependable day-in, day-out across all areas of the distillery, from incoming products and raw materials, specialist storage requirements, right through to despatch of the finished product worldwide. 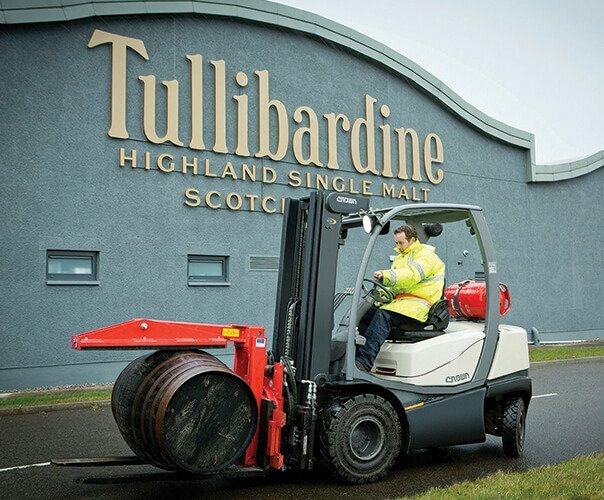 The key factor in awarding Crown Lift Trucks the contract to supply Tullibardine with material handling equipment was its ability to meet the specialist requirements of a whiskey distillery – in particular where barrel-handling applications were concerned. The Tullibardine fleet includes Crown’s C-5 Series gas forklift which performs multiple tasks throughout the site. It is fitted with a specialist rotating barrel clamp, providing smooth, precise handling and ease of operation to ensure operator productivity is maximized. Featuring Crown’s low-emission 2.4-liter industrial engine, a robust hydrodynamic transaxle and dual radiator cooling system, the C-5 Series delivers extended service intervals and reduced costs. Compact dimensions make Crown’s SC Series three-wheel electric forklift perfectly suited to indoor applications where space is at a premium. With a near zero-turn radius and outstanding visibility, operators can accurately position the SC Series in even the tightest aisles. In the confines of the Tullibardine bonded warehouse, its nimble gait and precise controllability come into their own. Fitted with a tilting cask-kicker attachment, the SC Series affords the operator maximum control while lifting the cask to the correct height before tilting and accurately rolling it into position in the storage racks. From an operational point of view, this vapor in the air can potentially be a hazard. The Crown trucks are fitted with a system which can shut down the truck if vapor levels rise above a pre-set limit, preventing it from being the source of ignition for an explosion. Tullibardine benefits from extended service intervals and reduced costs with Crown’s versatile C-5 Series LPG-powered forklift, which features a robust hydrodynamic transaxle and dual radiator cooling system. Operators are well cared for with Crown’s Intrinsic Stability System™ which proactively ensures optimal safety and performance – and their acceptance of the trucks has been excellent. The operator’s cabin provides excellent visibility. Hydraulic levers with tactile feedback ensure the interchangeable rotating barrel clamp can be positioned with absolute precision, allowing safe and secure handling of potentially awkward loads.